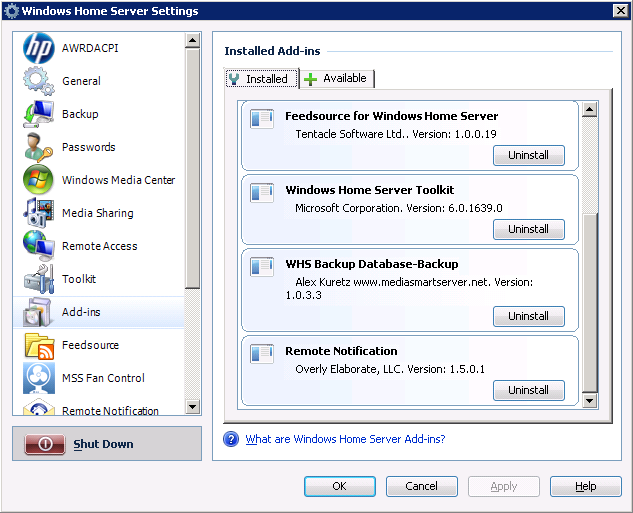 Windows Home Server makes it easy to add new features to your Home Server through the installation of Add-Ins. To install an Add-In, download the .msi file and save it to your server’s Software share in the Add-Ins directory. Next, open the Windows Home Server console, navigate to the Settings tab, and then to the Add-Ins tab. Find Remote Notification in the list of available Add-Ins and click Install. To uninstall an Add-In, find Remote Notification in the list of Installed Add-Ins and click Uninstall.